Pure Board Shop is stoked to be the only @landyachtz longboard dealer in the area. "Landyachtz is our number 1 selling longboard, thanks to value, quality and diversion of products." 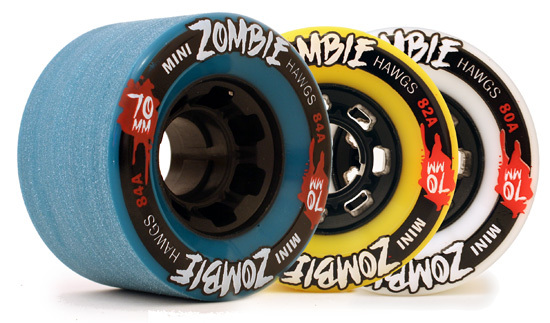 Landyachtz longboard decks and their longboard wheel company, Hawgs, are Pure's number 1 sellers. Landyachtz started in the fall of 1997 when Michael Perreten and Thomas Edstrand met up at the University of Victoria. They had been friends and skated together in elementary school but had not seen each other in years. Growing up on the Northshore of Vancouver they were exposed to skating steep hills at a very young age. When they ran into each other, Mike was riding a sweet 40" fiber-glassed board he had made to get around campus. Mike had been living in Whistler and had made some boards in his spare time. Tom had recently been down in California and seen some longboards and wanted to ride one at first site. He was tempted to buy one but thought he could make one instead. Tom was one of those kids that was always drawing and really into art. Mike was very handy and good at building things. They decided to team up and started making some personal rides in Tom's basement. You wouldn't believe how much time went into some of the first boards they made. They spent that school year learning to make skateboards. There was a lot of trial and error, a lot of prototypes and a lot of crazy ideas. That summer Mike went back to framing houses in Whistler and Tom got a job at a sign shop so he could learn how to silkscreen and work on his art. Halfway through the summer they ditched their jobs and focused entirely on building boards. They moved to Whistler because they got access to the tuning room in the basement of the Blackcomb ski club cabin. The ski club's cabin was at the top of a long hill with lots of hairpins. Again, there was a lot of learning and wacky ideas. They knew they had to produce boards that were better than the existing boards on the market so they produced countless prototypes and road them down the gnarly test hill. One of the prototypes was a lowered skateboard with the trucks mounted above the foot platform. Around the same time, Jody Wilcock was making lowered boards under the name Highway longboards in Prince George, BC. A couple years later they would meet Jody(aka Shnitzel) and that's when the lowered skateboard revolution really began. They teamed up to produce the DH Race and Urban Assault. These boards were the first of their kind and would introduce the world to the advantages of a lowered skateboard. Over the next 2 years the workshop moved four times into different basements and garages. At one time, Mike and Tom had their press setup in a tiny tool shed in the backyard of a house they rented. Mike actually pressed over 100 Chiefs in that shed. They also made a spray booth in their carport out of poly where Tom screened and sprayed the boards. They did what they could with what they had. Although they didn't have a high tech facility they were able to produce very innovative boards because of their creativity and their relentless testing. When Mike and Tom finished University, they moved back to Vancouver. They rented a 350sqft mezzanine from local snowboard company, Invasion Snowboards. Landyachtz finally had a home. The factory was located on the Northshore of Vancouver where the two had grown up and where some of the best longboarding in the world can be found. This terrain was an important part in making Landyachtz. The terrain is very steep and demanding so the products that Landyachtz made had to really perform. It also made for super fun R&D sessions after work. In 2001 Mike and Tom met Bricin Lyons(aka Striker). He was a super energetic rider with a serious need for speed, so Landyachtz decided to sponsor him. At 285lbs and riding like a human bowling ball, Bricin put Landyachtz boards to the test and proved their durability. Bricin went on to form Coastlongboarding which has put on over 30 longboarding events including the world renowned Danger Bay. Landyachtz and Coastlongboarding put a ton of time and effort into these events to help build the sport of Longboarding. With all these events, Vancouver transformed into a longboarding mecca, attracting riders from all over the world. Along with helping organize longboarding events Landyachtz has sponsored a ton of riders over the years. By sponsoring riders and being involved in racing, Landyachtz has been able to continue to produce top of the line innovative products that perform at the highest level. In 2005, Tom won the IGSA World Cup for downhill skateboarding. The racing success continued with Frederick Lindstrom winning in 2006 and Scott'Scoot' Smith taking the title in 2008. Landyachtz used racing as a way to test and develop products that improve longboarding for every discipline; downhill, freeride, carving, cruising and commuting. In 2005, after countless epoxy wars and debates on skiing vs. snowboarding, the guys from Invasion finally moved out and Landyachtz took over the entire 2700sqft space. It was a big step but the business and the sport were growing so it was a risk they had to take. After about a year, the 2700sqft factory was overflowing and Landyachtz needed more space. There was another warehouse across the street of similar size so they rented it for packing and shipping. The problem was getting the freshly manufactured boards across the busy street to be assembled and shipped. For about a year Landyachtz employees played frogger crossing 1st St. in North Vancouver till we finally found our current home.